The Urban Entomology Program at the University of California, Riverside and AgriTurf Distributing are joining forces to present The UCR Fumigation School on Wednesday and Thursday, November 15 and 16, 2017. Classes will be held at UCR Extension, 1200 University Ave., Riverside, CA. If you plan to camp this summer, remember to wait until you arrive at your destination before you purchase firewood. Why? If you bring your own firewood to a campground, you could unknowingly spread invasive pests and diseases that can harm local trees. New infestations of tree-killing insects and diseases are often found in campgrounds and parks as a result of campers moving firewood. Once you arrive at your destination, pests can emerge from the firewood and spread to the trees and forests where you camp. Invasive and hard-to-control pests kill several million native trees every year, causing environmental and economic problems. Today's post for National Invasive Species Week highlights two ambrosia beetles that are detrimental to certain trees. Ambrosia beetles are highly specialized beetles that excavate tunnels in usually weakened or dead trees and cultivate fungal gardens, which they feed upon. 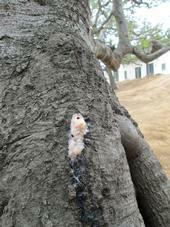 Below are two such invasive beetle-fungal complexes that are currently impacting trees and forests in California. Declining coast live oak (Quercus agrifolia) trees have recently been found throughout urban landscapes in Los Angeles, Orange, Riverside, Santa Barbara, Ventura and Monterey counties. A fungus associated with a specific beetle is causing the decline by spreading what is known as “foamy bark canker disease” (Figures 1 and 2).